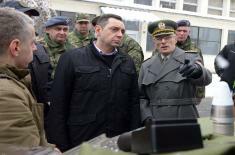 Today, at the Military Technical Institute – MTI, Minister of Defense, Aleksandar Vulin, Chief of the General Staff of the Serbian Armed Forces, Lieutenant General Milan Mojsilović, accompanied by Assistant of the Minister of Defense for Material Resources, Nenad Miloradović PhD, attended the presentation of weapons and military equipment that have been introduced into the operational use of the Serbian Armed Forces or are in the final phase of testing. - In technical terms, 2018 was perhaps the best year in the recent history of Serbia. 29 different systems were introduced into the Serbian Armed Forces, and in 2009, as the best year to date, only eight were introduced. All this is the fruit of these peoples’ effort. Last year, we have welcomed 50 young engineers at the MTI, we have retained 45 of the already retired, as their knowledge is too valuable to be dismissed at leisure and not used precisely here, at the MTI - said the Minister of Defense. Minister Vulin said that employment of another 75 young engineers is planned for this year and that the staffing would be significantly improved; material resources have been provided, so that the MTI will also be able to duly reward the best and rise the earnings in accordance with the results of their work. - Government of the Republic of Serbia and the President of the Republic of Serbia and the Supreme Commander of the Serbian Armed Forces take special care of the scientific capabilities and things that we are outstanding in. What you have seen here are complex systems that have been long in the making; all of them have been finalized and each of them are of great significance – emphasized Minister Vulin, adding that all the weapons and equipment that are presented today at the MTI are significant for the Serbian Armed Forces. - The Serbian Armed Forces are being intensively equipped and armed, and the Serbian Armed Forces must be and are ready to protect the peace and our way of life, to protect every part of our territory and to protect all Serbs regardless of where they live - said Minister Vulin. As a military neutral country, as Minister Vulin pointed out, that is neither a member the NATO or any other military alliance nor will be, we must stand ready to implement on our own each of the functions and capabilities that are at the disposal of far larger and richer armed forces. - Since we are not member of the NATO or any other military alliance and will not be, we must be capable of responding to every challenge - said Minister Vulin. According to him, the safest way to do this is when you have institutes such as the MTI and when you possess a defense industry such as Serbia; when you are able to satisfy most of your needs from your own production and resort to your own mental capacity. - Only what you produce yourself is yours and only the technology that you conquer is your own technology. Anything else, for political or for any other reason, can be denied to you. Thanks to the effort of these people, we can be equipped with the most modern systems, and at the lowest possible prices. All that you have seen here, we simply would not have had the money for had we purchased on the world market. Even much richer countries would not be able to afford this if they were supplied exclusively from the market. However, if you invest in your people and your engineers and your defense industry, then you can develop and strengthen the armed forces, just as we do and are able to remain at the level of the most developed countries in the world - emphasized Minister Vulin. Chief of the General Staff, General Mojsilović, emphasized that he congratulates the members of MTI for the results achieved in 2018, on projects and prospects for 2019, adding that all that was presented today inspires optimism. According to him, raising the operational capabilities of the Serbian Armed Forces is necessary in order to be fully capable of responding to all challenges, risks and threats. - I have had the opportunity to see that everything that we introduced into the Serbian Armed Forces gains significance in the segment related to further modernization and upgrading a certain quality in the functional and security sense. What was introduced into the field of weapons and equipment towards the end of 2018 by the Decisions and Conclusions of the Chief Military Expert Council ensures the dynamics of continuity in further building of operational capabilities for certain categories or factors of operational capability in the long-term development plans - said General Mojsilović. According to Assistant Minister Nenad Miloradović, what was shown today is that the Ministry of Defense, MTI and the Defense Industry of Serbia are progressing in the implementation and achievement of their missions and tasks. - We have a very extensive task, to equip the Serbian Armed Forces to attain the desired capabilities, or to compensate for the shortcomings in a very limited time. Experts from the Serbian Armed Forces, the General Staff and the Ministry of Defense have stipulated 90 different weapon systems for equipping in the med-term. Of this, 76 should be systems that come from domestic development, the product of domestic intelligence and the domestic defense industry - said Miloradović, adding that the development of each system, especially of the complex ones, is a lengthy and complex process, which even for the richer countries may extend to 14, 15 or 20 years for the most complex systems. Second Lieutenant, Tamara Šević, who has been working at the Military Technical Institute in the Electronic Systems Department for two years, expressed satisfaction that she and her colleagues were appointed with this scientific institution following the completion of the Military Academy. - At the very beginning, we had the opportunity to work on very demanding projects and the pleasure of learning from colleagues who already have ample experience and were ready to pass that experience to us, said Lieutenant Šević, who works on the upgraded “Giraffe” radar and on the perfected anti-aircraft system “Bofors” on creation of a new target data receiver intended to digitally receive wireless data on the target from the “Giraffe” radar and to guide the cannon. During today's visit to the Military Technical Institute, more than 40 different types of weapons and military equipment that were introduced in the operational use or are in the final phase of testing could be seen. Among them, the most important are definitely the armored combat vehicle “Lazar-3”, artillery system NORA B-52, modernized “Oganj-LRSV”, modernized rocket system of the Air Defence KUB-M, radar P-40, field vehicle “FAP” 2832, remotely controlled unmanned platform "Mali Miloš", the Remotely Controlled Combat Station, the Self-Jammer – ROSZ 1, the base of the M16 combat armored vehicle, and various missiles, ammunition and igniters. In addition, the development and upgrading of personal equipment kits, as well as a set of protective ballistic equipment M-17, were presented.